Will companies pay a price in the coming years for relying on current predictions and conclusions about aging Baby Boomers? This post sounds a warning. Boomers will be teenagers forever—age 60 is the new 30. These statements capture some of the factoids* that have become accepted as Boomer characteristics. Current discussions about Boomer marketing are too often a diversion created by those struggling to hang on to models that served them well with yesterday’s youth markets, rather than discussing an insightful overview of a consumer majority never before experienced. For years, a small but knowledgeable group of professionals has decried the paradox of the images and icons used to portray an 18 year cohort (Woodstock, drugs, war protests, acid rock music, etc.). For example, as a leading-edge Baby Boomer, I did not protest the Vietnam War, but I did fight in this ‘police action.’ I liked some Beatles tunes, but never cared much for the Rolling Stones. In the 1960s, I preferred folk music and ballads over hard rock; and I did not smoke pot or use drugs. While I did drive a Volkswagen, it wasn’t a bus. My point: There are as many Baby Boomers who are the antithesis of Boomer icona and stereotypes, as there are those who mirror them. In essence, Baby Boomers encompass several generations – they are not one unique or homogenous cohort. Even though they will eventually share common later-life values, these adults view reality through vastly different experiential lenses. Baby Boomers will be teenagers forever—age 60 is the new 30. Myopic, overly simplistic and wrong! This factoid ignores developmental psychology research and condemns 78 million Boomers to terminal narcissism. It is at worst ageist, and at best replaces one stereotype with another. Although today’s older adults increasingly look forward to an active later life, these trends do not mean they are maturing any differently than their parents and grandparents. The current image of older people as a problem—unproductive adults declining in health and increasing in dependency—demeans this population and their predecessors. Representing older adults in this way marginalizes life’s second half. But to replace that image with one of a Skydiving Granny or the lifelong teenager ignores the central human need to find meaning, integrity and purpose in later life. Baby Boomers will be a drain on the economy and overwhelm healthcare systems. This is one of the most common and negative factoids touted by politicians looking to stroke a growing special interest group of seniors or, more appropriately, the publicly funded organizations serving them. Yes, this scenario could happen. But this perspective looks at tomorrow through yesterday’s lens, forgetting that everything has changed. Baby Boomers will reinvent retirement. This statement gives too much credit to Boomers for a revolution well underway before they joined the Maturity Market. Leading-edge Baby Boomers will start turning 70 next year, and most of them will not retire fully until well into their mid-70’s, or older—if by then we still refer to this stage of life as retirement. In reality, the very concept of retirement is becoming outdated. Most are surprised that the 60’s leaders of the Viet Nam Protests and Hippie movement, were not hippies but members of the Eisenhower generation (Abbie Hoffman, Jane Fonda, Martin Luther King, Jr., etc.). Likewise, the Greatest Generation began reinventing retirement well over a decade ago. Rather than accepting systems designed to cater to and care for them, this cohort started demanding more opportunities for health and well-being services, and began pursuing lifelong growth and fulfillment. One sign is the growing demand for programs and services to support optimal aging brain health. Baby Boomers will not tolerate aging stereotypes. If this factoid were true, misguided media stories and advertisements targeting Boomers would not exist. In fact, a majority of these efforts were either created or approved by Boomers, who are both victims and perpetuators of aging stereotypes. Also, if this factoid were true, the 2005 White House Conference on Aging delegates (a large percentage of whom were Boomers) would have identified ageism and aging stereotypes as a major issue. Delegates did not even address this topic at the event. Since Baby Boomers outnumber any other 18-year age cohort, they will inevitably grow to hate how older people are stereotyped, just as a growing number of today’s 80 year-olds dislike how they are referred to and portrayed. In the end, marketing workshops that delve into purported Boomer attitudes and behaviors could keep consultants and companies busy for the next 10 years. But these workshops will have little impact on the bottom line if they continue to be grounded in factoids. No one buys anything or uses a service solely because of their age. Rather, individuals purchase services to satisfy wants, address needs and enjoy experiences. To gain the attention of Boomers, stories must connect with their values, rather than perpetuating factoids and stereotypes. The 65-and-older age group will grow 78% between 2010 and 2030, while the total population will increase just 18%, according to the US Census Bureau. Furthermore, “age 40 plus adults already comprise a New Consumer Majority of middle age and older adults, is a historical first,” wrote David B. Wolfe, author of Ageless Marketing. Few advertising agencies, consultants and businesses understand later-life values and how to connect with them. 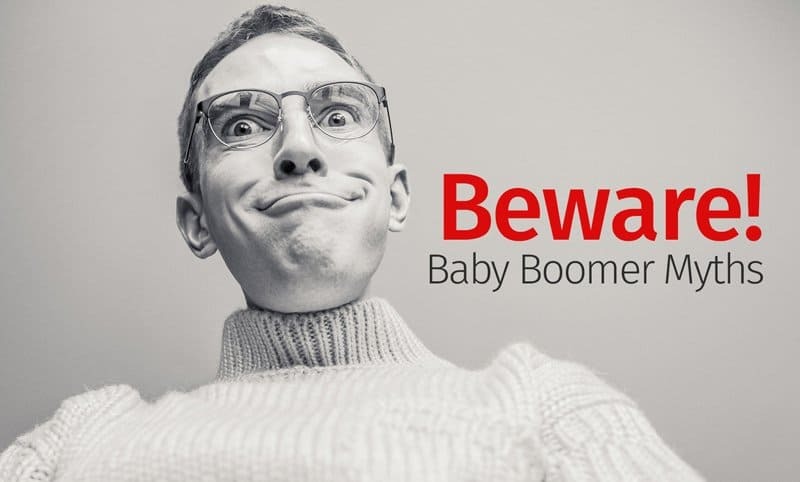 Accepting Boomer factoids with roots in aging stereotypes, companies will continue to waste billions on the wrong words, images and messaging. Researchers are just now documenting the problems caused by negative aging stereotypes. In the last 3 decades, we have replaced purpose with pills; productive lives with retirement packages; personal significance with shallow volunteer opportunities; and meaningful community involvement with mindless activities. Personally, I try to avoid using the term Boomer marketing, because it makes no more sense than senior marketing. I prefer developmental, inclusionary or ageless marketing instead. For that matter, I’m not crazy about using senior, elderly, retirement, senior citizen, Baby Boomer, Gen X’er, or any other generational labels or typologies. While some people buy products because of the label, they are unlikely to rally around a generational label. While senior/Boomer typologies have made research companies and ad agencies a lot of money, they exacerbate our misunderstanding of a values-centered age cohort of older adults, rather than improving the effectiveness of business communications. New rules and tools are needed to insure success in a market dominated by middle-aged and older adults. It is time to view the market through a new lens. When it comes to meeting the needs of the New Consumer Majority, the youth lens of yesterday provides a distorted image of reality. The tools needed to grind a new lens for future success are readily available to those with the vision to use them. * A factoid refers to unverified or inaccurate information presented in the press as factual, often as part of a publicity effort, then accepted as true because of frequent repetition.